Okay, for any of you who are wondering about this state of Maine... voila. I didn't take this picture, but Ellie, a gal in my class did, the other morning right out her kitchen window!! This young moose was contentedly munching on apples straight off the tree. 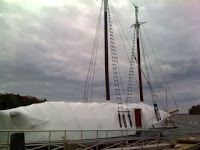 Here is another typical Maine winter sight that some might say looks like a cocoon. But I think it looks like a gigantic floating maggot. 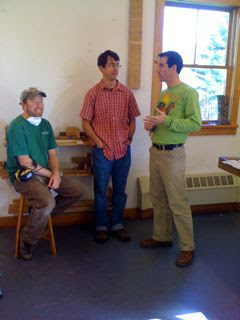 This last picture shows fine examples of a prominent variety of a Maine human: the furniture-maker. They are my teachers, Tim Rousseau (l), Aaron Fedarko (c), and Mason McBrien.